I have my leaders and enders Scrap Garden ( or Lozenges) top done and hanging on the design wall. It is ready to quilt, ironed and backing made. I started it last fall. Bonnie Hunter of Quiltville had Lozenges as last years Leaders and Enders challenge. I had many fabrics that just did not fit into one colour family so they could go here. I love to look back at all the different prints. I think you could make this in a few different sizes. 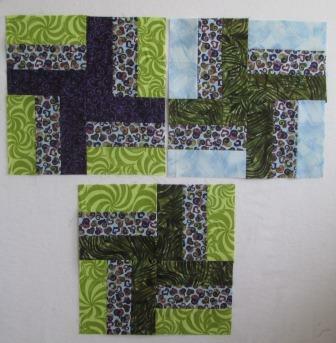 I chose to start mine with 6" by 3" retangles and added the 2" square to the 4 corners. I sewed from one corner to the other. I am very pleased with this top. I think a have a Kaffe Fassett book with this on the front cover. That pattern uses a large rectangle, I think 4 by 8". Bonnie has now released the next Leaders and Enders Challenge, it is Tumblers. I have a few cut already. I am using my 2 1/2" strips and the Dresden Plate ruler. Next up is some blocks I made back in May when I did not post. I did get a photo of the blocks before I sent them FREE. I made them for the suit case exchange with the Leduc Black Gold Quilt Patch. You ask What is the suit case exchange?. Well, we have box ( not a case), there is a fabric in it and a pattern. We are to make a block or 2 or 3 to add to the box. My name was pulled first and these are my blocks. Then I handed the case back and it moves on to the next name pulled. When we run out of the main fabric then we draw a name. I will get 3 chances to win all the blocks back. I had to use some lime green just so the blocks have some life to them. I have added this post to Design Wall Monday at Judy's. Beautiful lozenges! 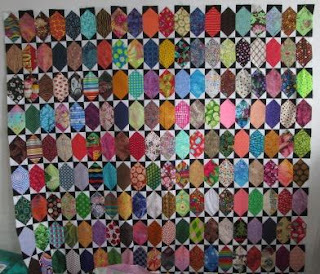 Such a great way to showcase your fabulous fabric collection. That quilt looks great - so bright and cheery. Great job. Love your Scrap Garden! Well done. Your Lozenges look great! Scrapalicious Deliciousness!! 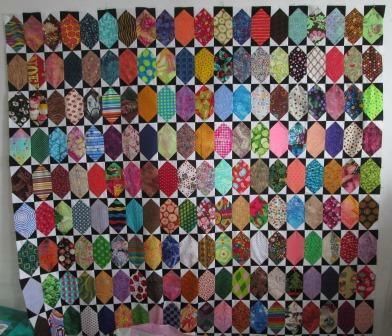 Love the lozenges... great scrap quilt!